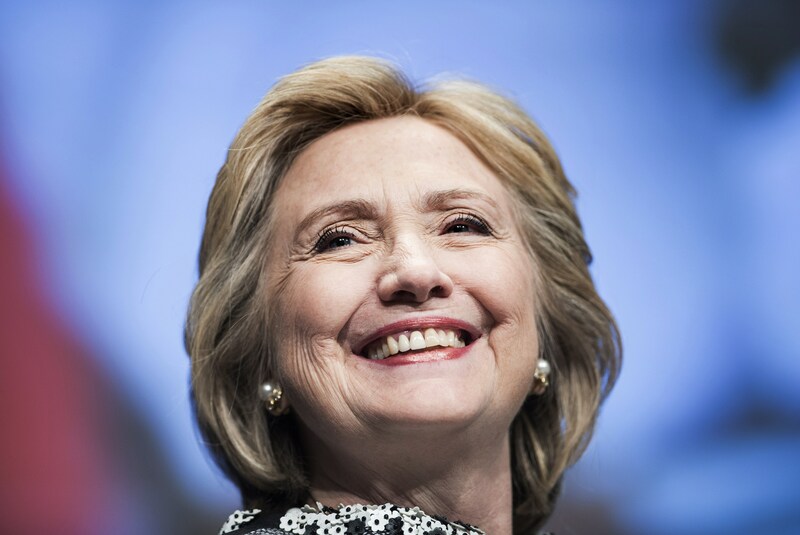 For a political action committee whose mission is to endorse and elect female pro-choice Democratic candidates into office, who better to have as a guest of honor than Hillary Clinton? Maybe-probably-definitely Democratic nominee Clinton spoke at the EMILY's List 30th anniversary gala in Washington D.C. on Tuesday night. Despite her recent controversy over her personal email account, Hillary received a warm welcome at the gala, where nearly every other speaker voiced their support for Hillary as president. And Clinton didn't disappoint, delivering an inspiring speech that was full of teases to her run. The former first lady and secretary of state opened her speech with a lighthearted joke referencing #TheDress, pointing to her purple pantsuit and saying, "Despite what you think, this outfit is not actually white and gold." Clearly, Hillary wouldn't be a humorless, out-of-touch president. She also touched on more serious topics, like middle-class economics and equal pay — issues that are expected to be at the center of her campaign. We’re fighting for an economy that includes everyone and works for everyone. We're not buying that old, trickle-down economics that didn't work before and can never work again. When any parent is shortchanged, our economy is shortchanged. But besides discussing the issues close to her heart, she also directed the attention on the women in the crowd who are close to her heart. When I look at this room, I see leaders. Clinton took the opportunity to pay special tribute to retiring Maryland Sen. Barbara Mikulski and former Arizona Rep. Gabrielle Giffords. In life you get the chance to make a million decisions.... Some of them are big, like, do you run for office? I suppose it's fair to say, don't you someday want to see a woman president of the United States of America? In 2008, Hillary Clinton put 18 million cracks in the glass ceiling. ... In 2016, it's time to shatter that glass ceiling and put a woman in the White House. Hillary, you heard us. Just give us the word, and we'll be by your side. That same sentiment was echoed by nearly every other speaker at the event. Sen. Al Franken of Minnesota joked that Clinton's granddaughter call both grandparents "POTUS." Top Chef host Padma Lakshmi went ahead and called her "our next president." And Nancy Pelosi said that Clinton would make one of the "most qualified presidents in the history of the United States of America." It was a perfectly timed respite from the backlash that Clinton's been receiving since the New York Times reported that the former secretary of state had used a personal email account at the State Department and therefore avoided having her correspondences be recorded, per federal policy. It remains to be seen how the scandal will affect her chances as the Democratic nominee and as president, but if the gala was any indication, it shouldn't change a thing.